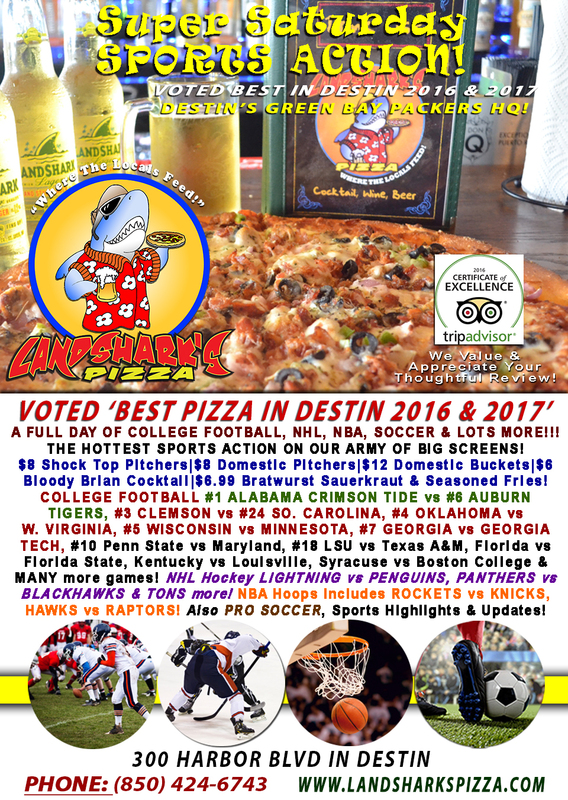 / Best Calzone in Destin FL / Watch COLLEGE FOOTBALL at Landshark’s #2 MIAMI $8 PITCHERS! NHL, NBA plus $9.99 2-Topping Calzone w/Brewsky! Watch COLLEGE FOOTBALL at Landshark’s #2 MIAMI $8 PITCHERS! 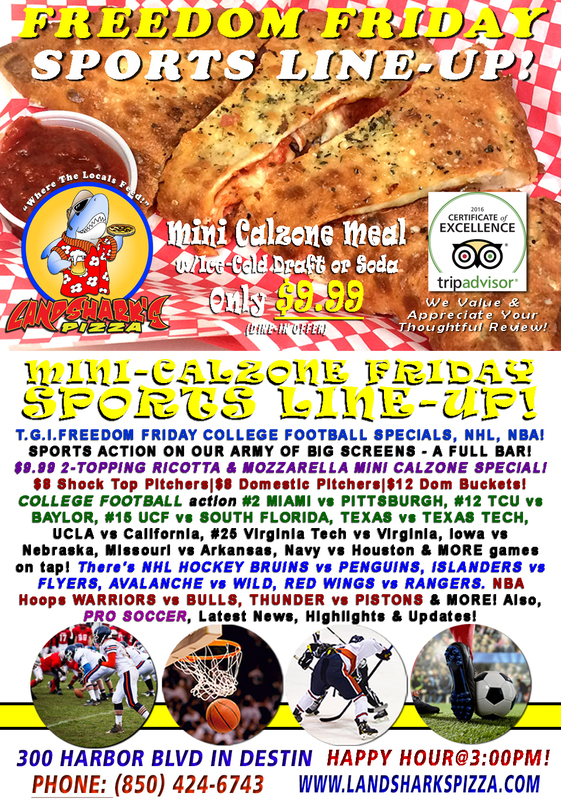 NHL, NBA plus $9.99 2-Topping Calzone w/Brewsky! GREAT SPECIALS DURING TODAY’S EXCITING COLLEGE GAMES: $8 Shock Top Pitchers|$8 Domestic Pitchers|$12 Domestic Buckets! Coming fresh out of a Thanksgiving food coma & ready to rock with NCAA College Football, NHL Hockey, NBA Hoops and more along with a 2-TOPPING RICOTTA & MOZZARELLA MONSTER MINI-CALZONE with an ICE COLD DRAFT or Soft Drink only $9.99 dine-in special to go with great sports on an army of big screens and a full bar! SPORTS ON OUR ARMY OF BIG SCREENS – COLLEGE FOOTBALL action #2 MIAMI vs PITTSBURGH, #12 TCU vs BAYLOR, #15 UCF vs SOUTH FLORIDA, TEXAS vs TEXAS TECH, UCLA vs California, #25 Virginia Tech vs Virginia, Iowa vs Nebraska, Missouri vs Arkansas, Navy vs Houston & MORE games on tap! There’s NHL HOCKEY Fine Arts Entertainment BRUINS vs PENGUINS, ISLANDERS vs FLYERS, AVALANCHE vs WILD, RED WINGS vs RANGERS, Lightning vs Capitals, Sharks vs Golden Knights, Oilers vs Sabres, Senators vs Blue Jackets & LOTS more! NBA Hoops WARRIORS vs BULLS, THUNDER vs PISTONS, CAVALIERS vs HORNETS, HAWKS vs KNICKS, Celtics vs Magic, Nuggets vs Grizzlies, Pacers vs Raptors & more! Also, PRO SOCCER coverage plus plenty of other Sports Broadcasts, Sporting News, Analysis, and Commentary! Previous Post: « Closed Thanksgiving – We Open NORMAL Time on Friday|HAPPY THANKSGIVING!